Identify and recognize the design and performance aspects of glass and glazing as part of an energy-efficient, comfortable, and code-compliant building exterior. Assess the health and safety aspects of wall surfaces as they relate to durability and sustainability. Explain the significance of providing flexible spaces in university and college settings for general well-being, functionality, and energy performance. Higher-education facilities provide some unique challenges for designers due to the multiplicity of design criteria and the variability of the ways different buildings are used on a college campus. Academic buildings, for example, have different needs from residential ones, which are still different from laboratory, administrative, and athletic ones. Of course, all higher-education buildings have to provide appropriate security, be durable over the long term, remain functional 24/7 in many cases, and offer access to modern and changing technologies. From a design standpoint, higher-education facilities have allowed architects to create some excellent architecture even while sometimes being required to fit in with a predetermined campus aesthetic. Colleges and universities are places of innovation and creativity but need to operate pragmatically and cost effectively over time too. 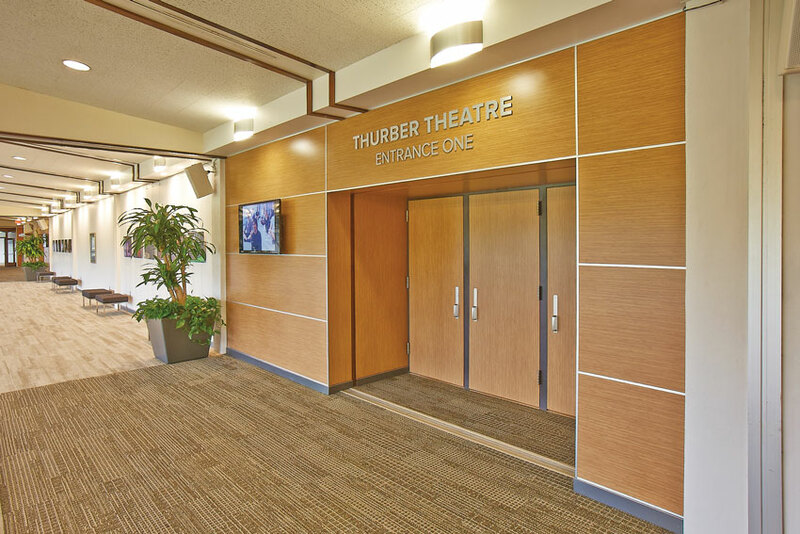 Architects and other design professionals are tasked with finding the balance through design, as shown here at the Ohio State University, Department of Theater, Drake Performance Center. How can architects stay ahead of the curve on all of this diversity at universities and colleges? One place to start is by looking at some of the particular aspects of exterior and interior design that can be used in many of these different settings to meet the various design criteria. In this course, we will look at some of those aspects for some of the most current thoughts and design techniques for successful higher-education designs. While creativity is clearly and appropriately embraced in higher-education design, fiscal responsibility and functionality are also very strongly required. This is especially true since the college or university will typically not only oversee the design and construction of their buildings but will also be responsible for the long-term operation and maintenance of those buildings. Typically, the capital improvements budget is different and separate from the operations and maintenance budgets, but the truly enlightened campus staff will see the obvious connection between the two. Regardless, it is the role of the architect and design team to find the proper balance between creative design, functionality, and overall budget-conscious high performance. This is true whether the focus is new construction or renovation and applies regardless of building use. One of the most visible places to begin looking at this balance is the exterior facade of a higher-education building. Aesthetics will quickly be influenced by the building function, the surrounding buildings, material preferences, and the creative talent of the design team. Performance issues will be addressed first in opaque wall areas through the makeup and integration of the needed thermal, water, air, and vapor barriers. Then, the use of glass and glazing often becomes the focus of considerable design effort both in terms of appearance and energy efficiency. Most architects are by now familiar with the fact that multiple independent studies have demonstrated the benefits of natural daylighting in learning situations. 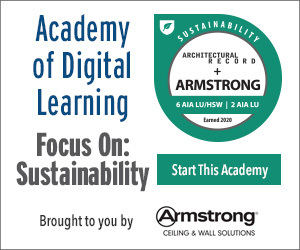 In particular, LEED rating systems for schools and other similar programs have been structured around evidence that students perform better when they have access to views and daylighting. The same is true in higher-education settings, so architects are looking for the right arrangements of glass that provide the best daylighting while still working within the overall design intent and performance requirements. This usually requires different iterations or different design concepts to select, model, assess, analyze, and then finalize a glazing layout that balances all design requirements while still staying on budget. Glass and glazing are integral parts of the design and performance of all types of higher-education buildings, such as the Michigan State University Bioengineering Facility (left) in East Lansing, Michigan, designed by Integrated Design Solutions and the Pattison Centre of Excellence at Okanagan College (right) in Kelowna, British Columbia, designed by CEI Architecture. In order to determine the overall performance of different design concepts for a facade, architects need to know the performance data for different types and specifications of glass. In the past three or four decades, the variety of glass options for appearance, energy performance, safety, and security have grown notably, so there is a full palette of choices for designers to consider. Further, the use of double- and triple-paned insulating glass units (IGUs) has become common with the option of treating each surface of each pane differently or even making them out of different types of glass. For example, an IGU makeup may be selected for energy efficiency, but the outer most pane may be laminated glass that has superior sound-deadening and shatter-resistant properties. The inner pane(s) may then be clear or color tinted with coatings to further enhance energy performance. It is quite logical then, given the range of variations and possibilities, to request assistance from glass manufacturers in summarizing, analyzing, and comparing different glass makeups against the energy and performance needs of a particular project. IGUs consist of two or three layers of glass separated by spacers in between them around the perimeter. The resulting air gap(s) between the panes of glass provides the insulating layer that slows down heat loss, keeps the inside glass surface warmer, and reduces the opportunity for condensation to form on the glass surfaces. From there, specific coatings and tints can be incorporated to create high-performance double- or triple-paned units. Some can be selected to control visible light and glare by reducing the amount of light that passes through the glass. Others can reflect the amount of unwanted solar heat gain (think warm months or warmer climates) or reduce heat loss (colder time of year or colder climates) as may be appropriate for the building. While high-performance double glazing is common, the use of triple-paned IGUs is becoming more common for college and university buildings in cold climates. This is because, after all of the assessment and analysis is done, it makes sense to add the extra pane of glass when looking at the big picture. The lifetime of campus buildings could easily span 50 years and, in most cases, much longer. A simple life-cycle assessment of high-performance triple glazing over the long haul can demonstrate reduced energy costs, greater comfort for those near the glazing, and a favorable payback. Further, universities commonly want to be seen on the cutting edge in the use of energy conservation measures, leading by example for the students while being as economical as possible. In addition to the multiple energy performance factors that triple glazing offers today’s buildings, another physical layer of glass provides superior noise reduction compared to a standard double-glazed unit. Overall U-factor: Calculating and testing the U-factor of an IGU is based on many details. First is the size of the air space, generally with larger being better up to a point. Second is the type of spacer used since it will affect the U-factor around the perimeter of an IGU. A “warm edge spacer” is typically made from a combination of materials (e.g., composite and thermally broken stainless steel) with low heat conductivity instead of a lower-performing aluminum spacer. The assembly of the IGU around its perimeter and the materials used to seal it together can similarly make a difference. This combination of all these fundamental components of the IGU plays a huge role in determining the “overall U-factor,” which is much more important than just the simple “center of the glass” U-factor that doesn’t tell the whole story. Perimeter sealant: The sealant around the perimeter of the IGU is the key to preserve the high performance of IGUs over time. If the seal fails, then the performance decreases and moisture may collect between the panes. In time, that moisture can cause permanent discoloration of the glass, and it would then need to be replaced. The sealant strength also contributes to the overall strength of the IGU; therefore, it is best to always coordinate with the window manufacturer to ensure the compatibility of the sealant with the IGU and the glazing framing. Performance enhancements: Once the basics of the IGU are determined, then the choices rely on several things that can enhance performance further. First is the gas that fills the spaces between the panes of glass. Common choices are ordinary air or inert gases, such as argon or krypton. Then manufacturers can apply high-performance coatings to different glass surfaces to control solar heat gain and enhance insulating value. Low emissivity (low-e) coatings are one example that are very effective at improving U-factors, but they also influence the color of the glass, so understanding the range of options here is worthwhile. 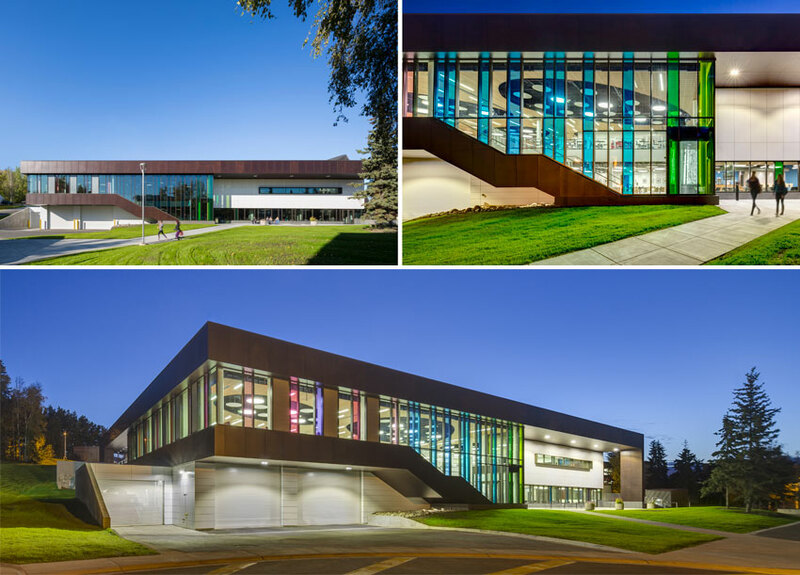 In much of North America, neutral-colored coated glass is a popular product for education projects. With a high visible light transmission, it delivers abundant natural light for daylighting and views. When used in a triple-glazed IGU with argon, for example, the U-factor is cut almost in half compared to double-pane uncoated glass, making it an excellent high-performance choice for colleges and universities in northern regions. Such high-performance glass can help higher-education facilities earn LEED and other green building standard designations. Coordination with frames: The size and strength of the frame material must be sufficient to accommodate the thickness of, and withstand the weight of, double or triple glazing units. A thermally broken aluminum window frame is often used due to its durability, noncorrosiveness, and better thermal performance. However, the location of the thermal break and the profile of how the glass, thermal break, and aluminum frame all work together needs to be looked at and assessed. 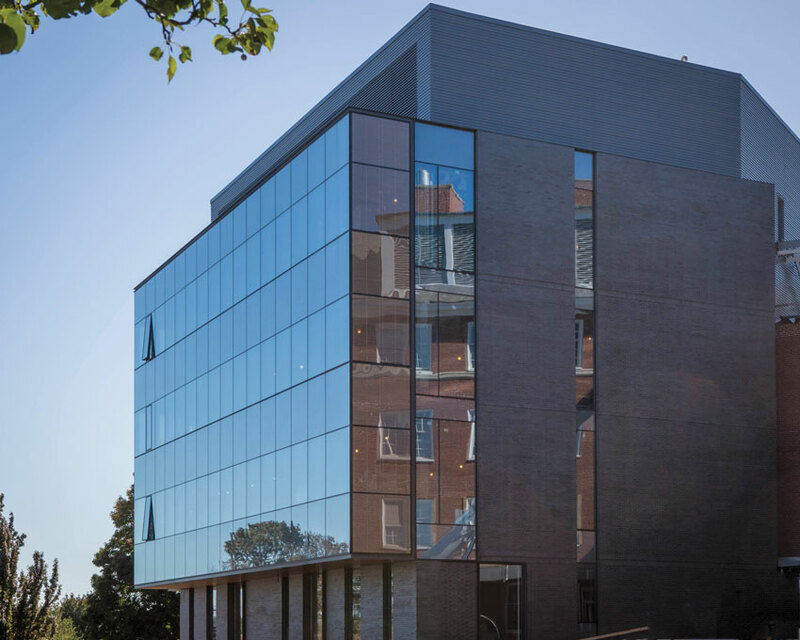 The Tufts University Science & Engineering Complex designed by the architectural firm Payette uses clear, triple-glazed, insulating glass with neutral coatings to achieve the balance between aesthetics and performance needed for its New England climate. The Project: The University of Alaska Fairbanks planned a 34,000-square-foot addition to and renovation of the Wood Center to expand the dining facility and create a campus destination. The Design Problem: Architect Perkins+Will wanted to create a building that was visually interesting and inviting to passers-by while so comfortable, occupants were happy to stay put, regardless of the season. The original building did little of either. Mentioning its few small, punched windows, Devin Kleiner, project architect, Associate at Perkins+Will, explains: “They were sitting nooks. It was one of the first things we talked about. The students wouldn’t sit near the windows, even if it were warm enough. It was a psychological thing.” The Perkins+Will team was determined to change that perception while taking into consideration the complexity of the climate, with its lows of minus 10 degrees Fahrenheit and highs that have reached 90 degrees Fahrenheit. The Results: The Perkins+Will vision resulted in a new, colorful dining hall. The two-story building overlooks southern views. The curtain wall honors the aurora borealis and gives the building a colorful, inviting exterior appearance, while occupants become part of an “otherworldly” light show: Because of the extreme low angle of the incoming sunlight, vividly colored shadows move through the entire depth of the building. As for how the university students and staff are using the facility, “There’s been a huge shift,” says Kleiner. “We interviewed one student who said he stopped going to the library to study. He just comes to the Wood Center. Between the outdoor view and the daylight coming in, it’s all about creating pleasant spaces. I thought that was really interesting that the library is being replaced. The students can see what is going on inside and want to be there.” Thanks to this overall team effort, the result is a campus destination that invites students in and keeps them there by offering a comfortable space with beautiful views year-round. Guardian CrystalBlue™ glass can be combined with many Guardian SunGuard® low-e coated glass products, giving architects a range of energy performances along with high visible light transmission in an in-demand subtle blue color. CrystalBlue glass is available coated and uncoated at 6-millimeter thickness in a variety of sizes. Gone are the days of modifying your design to include wall protection. Now, your design is the protection. With Aspex® Printed Wall Protection, you have the high-impact durability of IPC® Rigid Sheet with the clear, crisp imagery of digital printing. Because your graphic is back-printed onto the clear sheet, you don’t have to worry about scratching or vandals.